No work is insignificant, all labour that uplifts humanity has dignity and importance, and should be undertaken with pain staking excellence. Although my world is populated by numbers, I believe to give real service one must add something which cannot be bought or measured by money and that is sincerity and integrity. 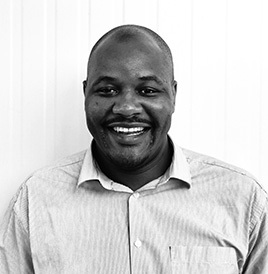 Trevor serves as THINK’s Finance Manager and is responsible for overseeing the organisation’s financial operations. Trevor aims to make a difference in the world by being part of team that brings change to people’s lives and in the world. Trevor is a SAIPA Ambassador; a program that promotes the accounting profession to young black students from disadvantaged backgrounds and mentors various young students in pursuing the career. Trevor is specialized in accounting and internal auditing and plays a role as advisory for companies in different sectors, including NGOs, in which, in his previous positions, he has led efforts to strengthen operating efficiency and help companies through transformative periods and a return to growth. Trevor holds an Accounting degree from Nelson Mandela University, a Diploma in Management Accounting from CIMA and is a Qualified Professional Accountant (SA) with the South African Institute of Professional Accountants.